Our custom swim bags are great for the kids to use at the pool or for swim practice. Large and spacious with a drawstring top, these personalized swim bags will be easily recognizable because of the unique design. Design a Personalized Sports Bag online in our easy to use design tool. These swim bags for kids or adults help you keep your trips to the leisure center stress-free. Made from a polyester textile that’s completely waterproof and personalized with your photo and name, there’ll be no accidental swaps happening in the changing rooms! I received my personalized totes in the mail. They were perfect, and I could not believe how fast I received them. What Will My Personalized Swim Bags Actually Look Like? Designed to hold all your gear, swimming bag fabric has a good flexibility to make sure you can load everything from your goggles through to a change of clothes! 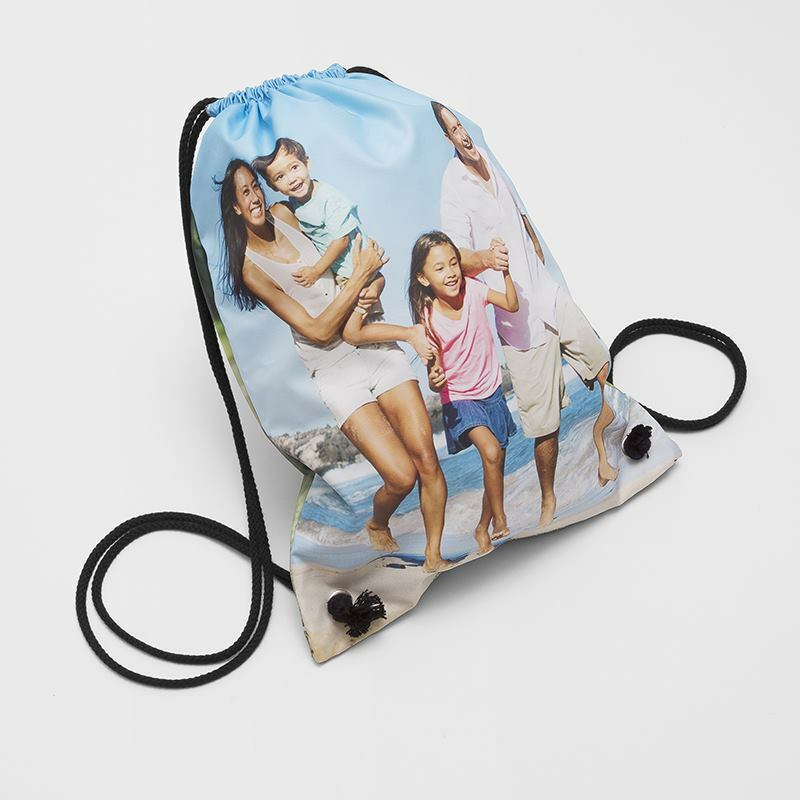 The drawstring is attached via sturdy metal eyelets that won’t come loose, meaning your kids can use these personalized swim bags time and time again without you having to worry about wear and tear. You get to print your unique photos or design onto both sides to make a truly outstanding drawstring swimming bag with essential waterproof qualities. Light stitching runs along the top that's part of the drawstring functionality, but it's highly unlikely this will impact your photo in any way. Who Is the Personalized Swim Bag For? Water babies, children who have swimming lessons in or out of school, adults competing in swim meets, beach lovers; the personalized waterproof kit bag makes swimming fun and helps children organise their gear and equipment. When heading to the leisure center or waterpark, everybody needs to take a swimming bag – girls, boys, adults…maybe even your pet!? So design your own swim bag for a bespoke gift unseen anywhere else. Like many of our products, personalized swimming bags come with a quantity discount, so buy more than one today and save money. Your personalized swim bag won’t fade in color thanks to our deep, permanent waterproof print, that we bond to the polyester textile for everlasting color. Each swimming kit bag is made to order, hand cutting and hand sewing the fabric for a polished, expert finish. Care: waterproof fabric needs a lot of careful attention when cleaning as it can lose its waterproof qualities. No dry cleaning and no soaking. Machine wash at 30°c and tumble dry on medium setting. (Or hang out to dry). The eyelets are situated in the bottom two corners to avoid any of your photo’s key features being cut out, so make sure there’s nothing important on your image in these areas when designing. Be inspired by the colors of the sea and give your kids personalized swimming bags that remind them of fun holiday memories. Swimming bags for school use can often look very boring and generic, so these custom swim kit bags are a great way to create excitement about their swimming lessons. The name personalisation is also a huge bonus; no more excuses for any lost equipment! For adults taking part in a competition, swimming bags with a smart font displaying your name and sports club is a perfect way to show you mean business.